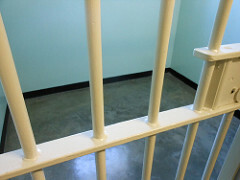 Suicides in prisons and jails are several times higher than the general population (Thigpen, Beauclair, Hutchinson & Zandi, 2010) for a variety of reasons: incarceration is stressful, mental health issues can be exacerbated in the corrections environment, and overcrowding and understaffing mean that suicidality can be hard to detect. This led to the development of the JSAT. The JSAT, or Jail Suicide Assessment Tool (Carlson, 2002) is a semi-structured tool featuring 24 domains associated with suicidality, These categories explore supports in your life, physical health, mental health, suicidal thoughts and attempts, and more. This tool is NOT to be confused with the similarly named Jail Screening Assessment Tool, also abbreviated as JSAT. Each domain or category in the JSAT features some sample words to help guide the answering of that question. For example, the category “Psychiatric treatment” includes the sample words “counseling, medication, compliance, hospitalization, diagnoses. The 24 components of the JSAT can be clustered under five broad categories, Mental Health, Physical Issues, Personality and Emotional State, Social Supports and Other / Situational. Each category is scored + (positive, lack of suicide risk), – (negative or risk of suicidality) or n (neutral). Additionally, the tool provides some ways of operationalizing these categories. Looking at the category “Suicidal intention”, the category is described as “Resolution to act, lethal plan with available means.” To mark + (absence of risk) the prisoner must convincingly deny any intent to harm themselves, while to mark – (presence of risk) they must express a desire to die by suicide in the near future and/or have a lethal suicide plan with available means. There have been no research studies that I am aware of evaluating the JSAT in a corrections population. It was prepared for the Federal Bureau of Prisons based on a previous tool called the Prison Suicide Risk Assessment Checklist (PSRAC), which itself has not been evaluated either. Let’s review each of these below. The JSAT includes elements covering history of suicide attempts, current suicide warning signs, presence of depression, self-injury and substance abuse issues, social supports, view of suicide and many other risk factors. On this basis the JSAT appears to be face valid for suicide – though I would question if all the elements are necessary in a comprehensive assessment. For example, “Cooperation” is identified as whether there is a good rapport between the interviewer and the client, as evidenced by a no-suicide contract. This is clearly not evidence-based (no suicide-contracts do not work), and rapport is not a suicide risk factor. “+” No indication of prominem character disorder traits. “-“A diagnosed personality disorder; prominent, innexible. maladaptive character traits which cause significant functional impairment or distress. Content validity explores whether the elements of an effective suicide risk assessment is covered. The acronym IS PATH WARM (Lester, Mcswain & Gunn, 2011), developed by the American Association of Suicidology (AAS) can be used to verify suicide warning signs. Trapped does not appear to be represented in any of the JSAT categories. Given the above, it appears the JSAT has adequate content validity for the risk factors of suicide, though some of them appear to be lumped together in multiple categories. A more effective tool would separate these categories to make sure the nuances are not overlooked. Reliability describes the ability for a tool’s consistency. This makes no claim to the correctness of the evaluation (known as validity), but rather that two people using the same tool with the same person will come to similar results. “+” Convincingly expresses a desire to survive. This is specific enough that two assessors should be able to come to the same conclusion. Would the JSAT stand up in court? This is often one of the most important elements of a risk assessment. Even if it is valid, if you can’t “show your work” and demonstrate that you have adequately considered all elements, you may be legally exposed in the event of a client suicide. The chronic and acute factors, and imminent warning signs of the JSAT have been adequately explored above. One major problem with the JSAT is that a simple + or – sign will not provide the detail required to defend the presence or absence of a risk factor. For example, reviewing “View of Death” above, how does the clinician prove the client welcomes a natural death? What good things do they believe would occur upon their death? Protective factors are explored fairly extensively in the JSAT, with Social Supports, Important Relationships, View of Death (which explores the idea of a perceived burden), Hope (future plans, reasons for living, hope for the future), Help Self (problem-solving ability and sense of control), Cognitive Themes (presence of optimism), and View of Suicide (beliefs or values that resist suicide). Brandy et. al. (2008) provide a number of suicide case studies, one of which is adapted here to demonstrate use of the JSAT. For more information see the original source. The most important elements here are the lack of supports, hopelessness and expressed intent to die. This client would be considered high risk for suicide given the lack of protective factors and should be restricted from accessing means for hanging. Applying the DCIB Risk Assessment as an alternative risk assessment for confirmation, we note that this client is showing suicide desire, capability, intent and has a lack of protective factors. Obegi, J. H., Rankin, J. M., Williams, J. J., & Ninivaggio, G. (2015). How to write a suicide risk assessment that’s clinically sound and legally defensible. Current Psychiatry, (3), 50. Cite this article as: MacDonald, D.K., (2016), "Jail Suicide Assessment Tool (JSAT)," retrieved on April 20, 2019 from http://dustinkmacdonald.com/jail-suicide-assessment-tool-jsat/. This entry was posted in Suicide and tagged corrections, risk factors, suicide assessment, suicide risk assessment. Bookmark the permalink.